The digital wave is causing retail empires to crumble, and these ruptures in retail are cause for worry regardless of sector. As such, many businesses are rushing to get their digital strategies in order, although Raconteur argues that having a digital strategy is not necessarily digital transformation. Echoing our own beliefs, the piece notes that digital transformation should not be pushed aside, as doing so causes meaning and impact to be diluted. Read more about digital transformation and how to implement digital strategies for business transformation over at Raconteur. In the 1950s, Management by Objectives was the managerial word of God. These rules made the world predictable, and ultimately, manageable. However, after morphing into strategic planning, this mindset is now falling out of favour, with disruptive technologies and new ideas springing up and ruining the best-laid plans. Now, we seek agility, which provides supreme flexibility in the age of change. But businesses need planning to keep going; giving us office hours and somewhere to work. Harvard Business Review looks at how planning has changed and where it is going, highlighting how agile planning methods are being implemented and what changes organisations may need to consider in facing the unexpected disruption hiding around the corner. Your first office job is a big step into a new world: the corporate world. This almost mythical world can require new rules and new ways of thinking, something many may not realise as they step into their stiff ‘new job’ suit. 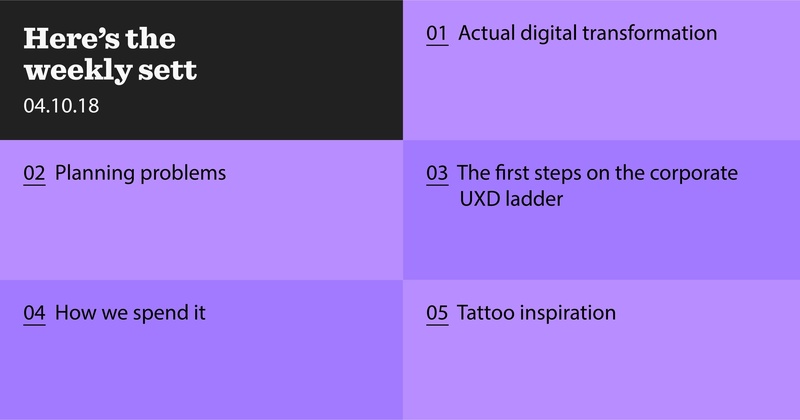 UX Collective has outlined some tips for those taking steps into professional UX Design roles. While many of us at Red Badger are well-experienced with the corporate rodeo, sometimes it's a good reminder to be patient, seek collaboration and feedback, and know when to compromise. With only 82 days till Christmas (not that we’re counting…), thoughts are turning to how this ‘golden quarter’ will look like for retail this year. BBC News has outlined how spending has changed in retail, and how online is creeping in. However, stateside, Retail Dive highlights that US spenders are poised to increase their holiday spending 4% year-on-year. This week from the Red Badger slack - some inspiration for body modification. Try this Twitter bot: Knuckle Tattoos. The bot provides a range of tattoos with just enough figures to fit on all your fingers, including ‘EVIL HOME’ and ‘WASP MENU’.